With spam filters getting stricter and ecommerce competition getting higher, engaging consumers via email can prove challenging. Consequently, increasing the number of touchpoints a person has with your brand is more important than ever; the more places a person can learn about your brand, the better. One of the most obvious places a consumer can hear your marketing messages is social media. But this doesn’t mean ditching email (which continues to be the most powerful marketing tool available today). It means using email as a way to promote your social media - after all, the two tools are singing from the same hymn sheet. … but, in 2017, is this practice really enough? Today, we live in a visual economy where, in order to really capture a consumer's attention and elicit a click, we need to deliver copy and images that are striking, engaging and stimulating. Here are 13 brands that have cottoned onto the fact that email can be used as a powerful tool for promoting your social media accounts in a creative way. The following emails are all part of a brand's triggered welcome series. As welcome emails aim to introduce new subscribers to a brand's identity/core values, it makes sense to include key information surrounding social, such as username/hashtags and examples of images/posts to be found on each channel. A closer look | After spelling out what the brand stands for, yarns and knitting kit provider Wool and the Gang (WATG) invites subscribers to get involved on social. 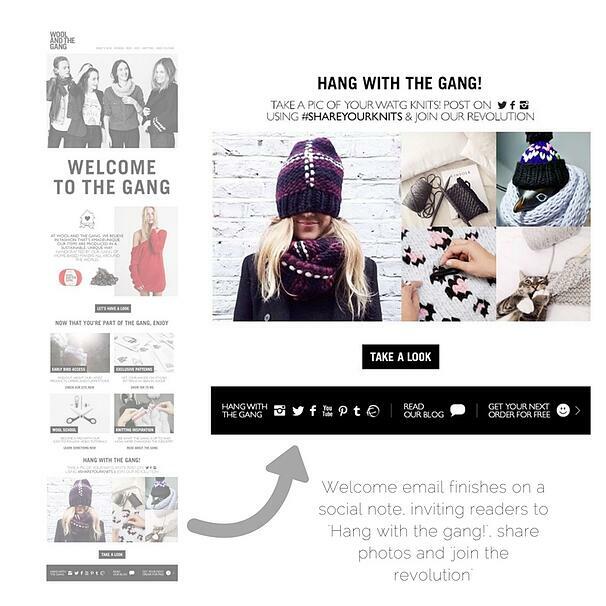 The colloquially worded call-to-action (CTA) "hang with the gang" creates a friendly, informal tone, making the person reading the email already feel part of a club (or, as WATG puts it, 'revolution') and more likely to click through. 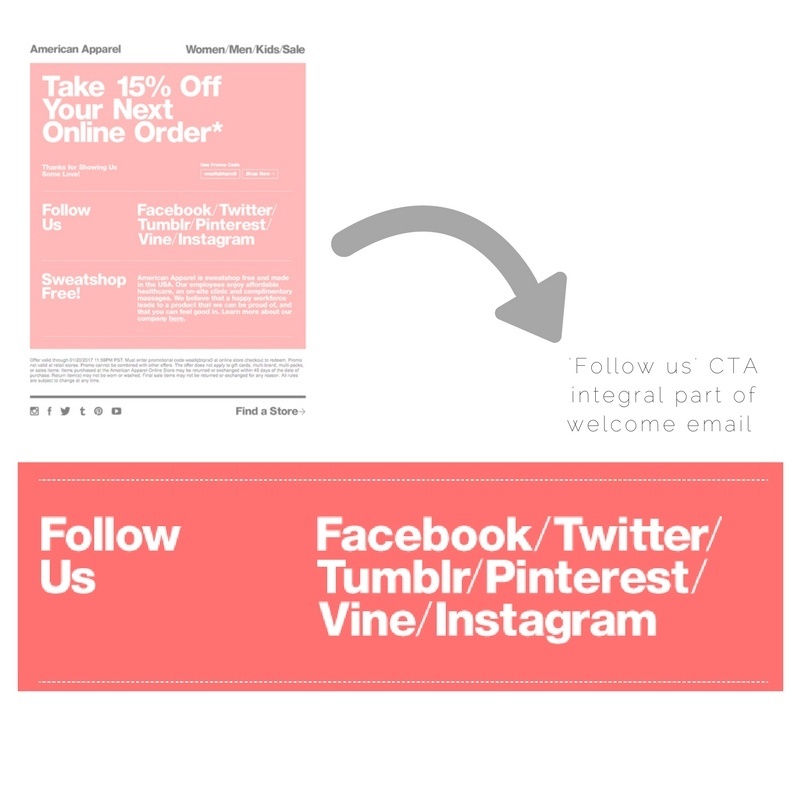 A closer look | American Apparel gives social media a leading role in this welcome email, placing the enlarged CTA 'Follow us' and social links in the centre of the template. Interestingly, social is given as much email space as the brand values section beneath - traditionally a key focus in a welcome series. A closer look | Sometimes it's nice to just have everything in one place. 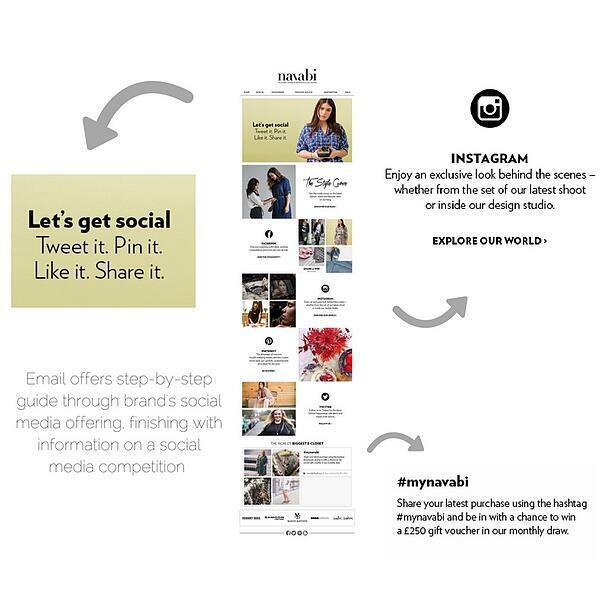 In this email, which forms part of the brand's welcome series, Navabi provides a step-by-step guide to its social scene - offering links, details such as usernames and hashtags and a brief summary of what each channel offers. A closer look | With the subject line "Nice to tweet you, I recognise your Facebook", this email is a classic example of brands using social as a way to approach consumers not like consumers but like peers. 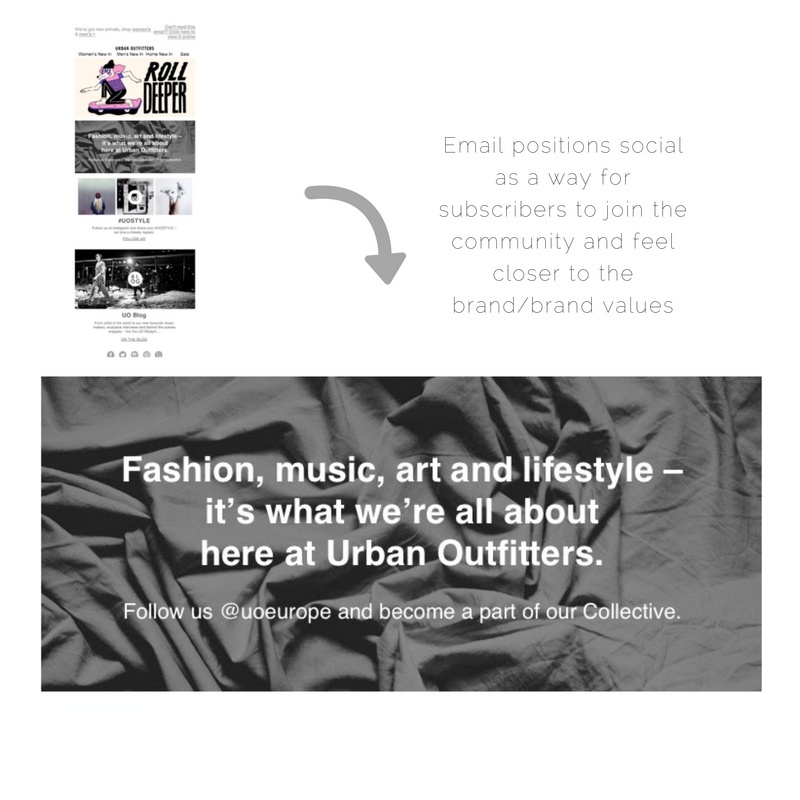 The email markets the brand's social channels as a community that celebrates 'fashion, music, art and lifestyle'. The template is image heavy, but plenty of short and snappy micro copy that's easy to read in the scroll of a button. 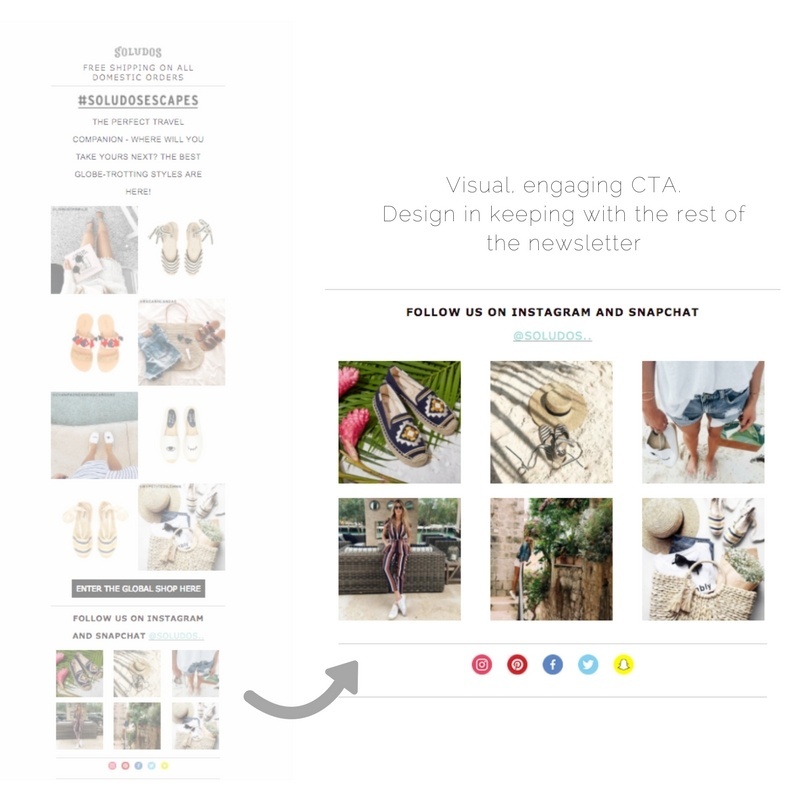 A closer look | With a modern, clean design, this Everlane email opens with the straightforward CTA 'Let's connect' before neatly listing each of its social channels - as well as what subscribers can find on each channel (for example, 'Exclusive content' can be found on Snapchat whereas 'Daily inspiration' can be found on Instagram). This email is very focused and doesn't bombard a recipient with too many messages or calls to action. A closer look |The main purpose of this Nordstrom email appears to be a promotion of its app, however the brand takes the opportunity to jump on the technology/'connect' theme by inviting fans of the brand to also 'follow' on social for updates, behind the scenes access and exclusive offers. A nice example of cross-promotion. A closer look | With the subject line "Let's start #DoingThings" together, this welcome email from Outdoor Voices promotes its journal (The Recreationalist) concurrently with its social media following. A closer look | This gif from Laura Ashley enables the brand to show as many images as possible in a single campaign. The way in which the email manages to effectively communicate its overall purpose (to follow the brand on social) without using more than 11 words is impressive. A closer look | This email from H&M is an example of a dedicated mail-out that’s not part of a triggered email series. 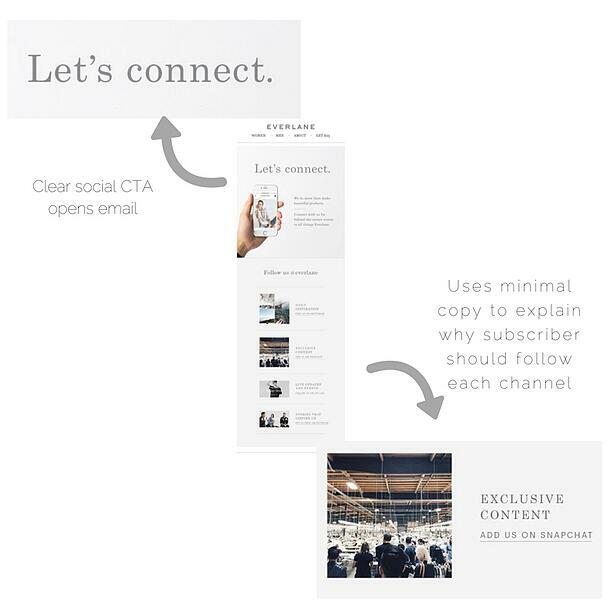 Most brands might be nervous to send out a newsletter devoted purely to social, but if you have a strong following and post regularly, it's worth trying out. As channels like Instagram and Pinterest are based around sharing interesting, nice-to-look-at images, emails such as this are a good opportunity to get creative and make your templates look great. 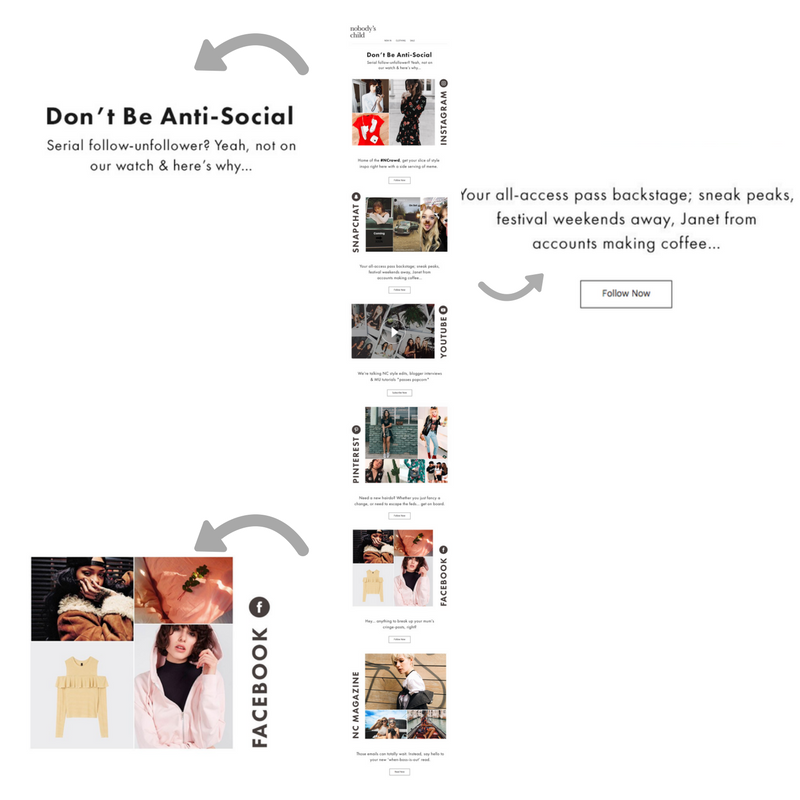 In H&M's example above, the edgy images and short and succinct copy make the email engaging and fun to look at, and the numerical form makes it easy to absorb and navigate. The length of the email also demonstrates the fact that H&M is active on a wide range of channels - emphasizing the size of its online community. A closer look | Nobody's Child is another brand with a broadcast email dedicated to promoting its social media following. With the bold headline "Don't be anti-social", the email goes on to list the reasons why subscribers should start following them on social (and not un-follow down the line!). Nobody's Child is renowned for brilliant copy and a conversational tone of voice, so the email is unsurprisingly pretty persuasive—bring on Janet's coffee snaps, we say! 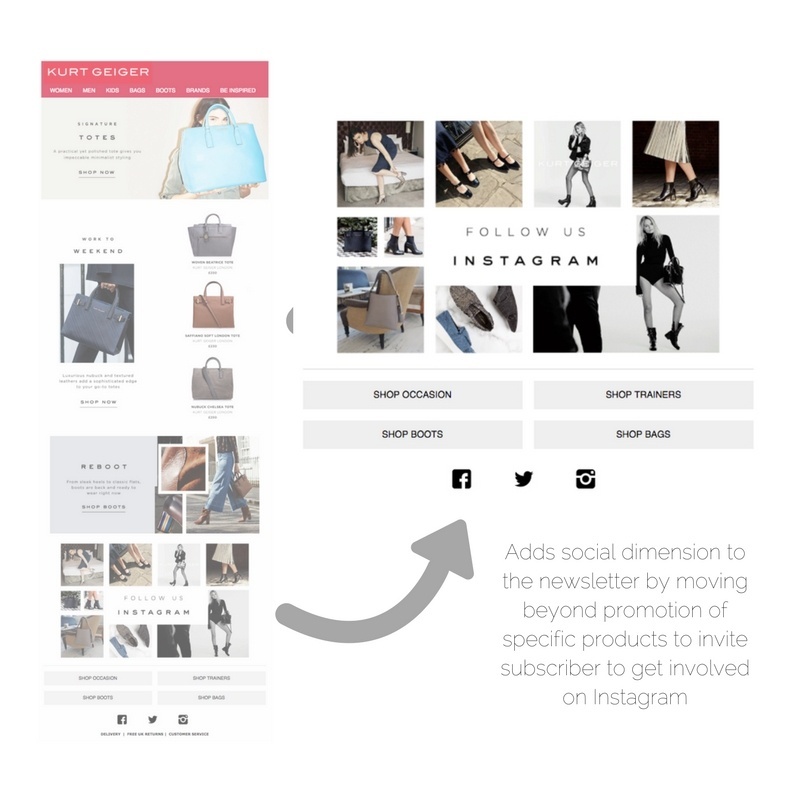 A closer look | Unlike the example above, the prime purpose of this Kurt Geiger newsletter isn't to promote social, but to promote the brand's products. 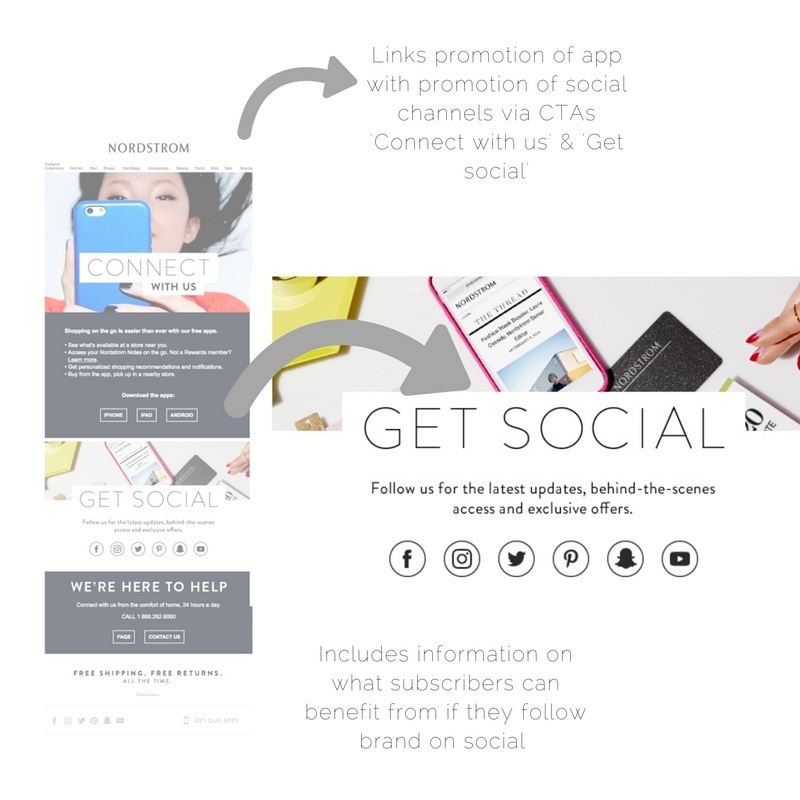 However, by using the same shape and style of images to advertise its social media offering, the social plug at the bottom manages to disguise itself as a valuable part of the email, rather than a standard promo. 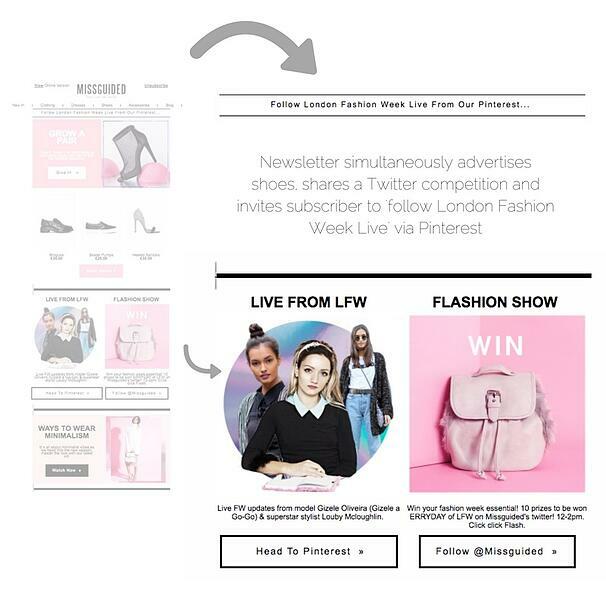 A closer look | This newsletter from Missguided manages to: celebrate the fact followers can now stay up to date with London Fashion Week live via Pinterest, advertise a social media competition and recommend shoes the recipient might like. It successfully manages to cross-promote its social media channels and product offering. A closer look | Here is another example of a brand relying on beautiful, inspirational lifestyle images to tell a story and encourage click-through. Opening with the hashtag title #Soludosescapes, the email automatically takes on a social feel, which is strengthened at the bottom of the email by the CTA "Follow us on Instagram and Snapchat". 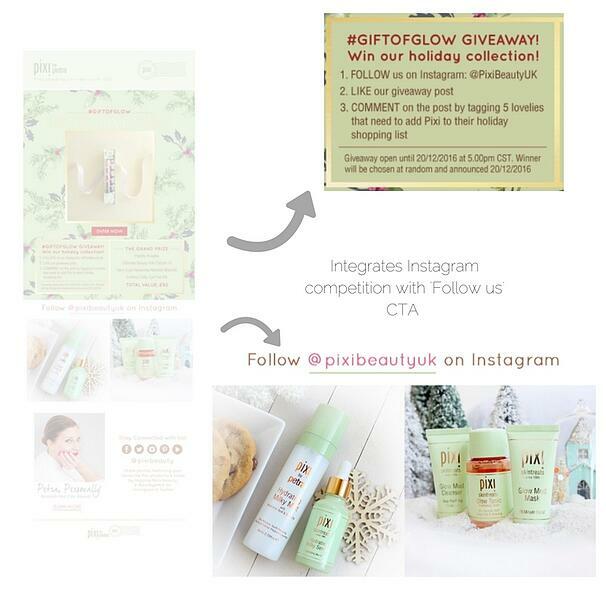 A closer look |In this email, Pixi Beauty uses the promotion of a social competition to encourage more Instagram visits, follows and interaction . 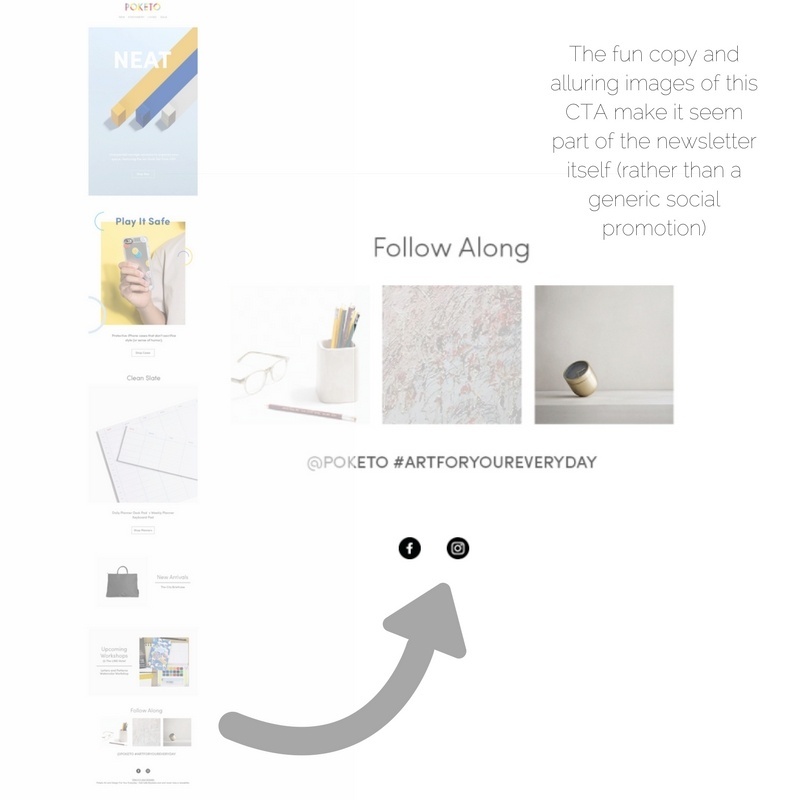 A closer look | In keeping with the rest of the newsletter's graceful tone, Poketo keeps its social section chilled with the sweet-sounding CTA "Follow Along". The decision to leave out any copy surrounding the username and hashtag (@Poketo #artforyoureveryday) also reinforces the email's understated feel, making a reader more likely to treat this section as a genuine piece of content, opposed to a standard social promo. In 2017, your social following is almost as important as your email list - for many brands born in social, it might even be more important. If your brand's social media channels are under performing and need a lot of work, hold off any promotion until they are ready to go - there's no point promoting something not worth looking at. But if/when your social channels are in order (i.e. posting regularly, interacting with followers and adhering to a brand 'style'), we hope the above examples help you start sharing the love via email.